Markswoman is a debut fantasy novel with a bit of a science fiction twist to the world building. I was drawn to the premise involving an order of all female assassins. However, while it was an all right read, it ultimately didn’t live up to my hopes. 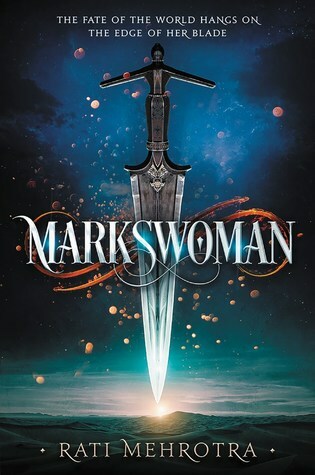 Markswoman opens with Kyra being sent on her first assassination, necessary for her to be inducted into the ranks of Markswomen in the Order of Kali, an all female group who are tasked with keeping peace and seeing justice served. Then, Kyra’s mentor dies under mysterious circumstances, ones she suspects were arranged by Tamsyn, another Markswoman who has seized control of the Order of Kali. When Kyra flees, she finds refugee with an order of Marksmen. She will pin all her hopes of saving her order on a desperate, risky chance. The beginning starts slow. Everything described in the back blurb takes… maybe the first third of the book? And unfortunately, the story never really picks up. While yes, Kyra’s decision (possible spoiler – challenging Tamsyn to a duel) is risky, it didn’t make for much excitement building up to the event itself. Also, I sort of just assumed Kyra would succeed on the basis of being a protagonist in possession of plot armor. I even guessed how she’d do it. Overall, Markswoman‘s plotting lacked tension and stakes and felt predictable. If you can’t guess from the premise, Kyra finds a love interest in the all male order (note -the book as a whole is very heteronormative, and there’s not the least hint that queer people exist in this world). The romance was annoying and stunk of insta-love. I have a hard time believing that two characters who have hardly had a conversation are in love. And I have an even harder time believing that someone as devoted to her order as Kyra is would even consider giving up her life as a Markswoman to run away with a boy she’s known for less than a month. I did like how the world building of Markswoman brought in an element of science fiction to the backstory. From what I can tell, the planet of Asiana was settled by humanity sometime before the story, and most technology has been lost. What remains is the telekinetic material used to make the Markswomens daggers and a network of transportation portals. Also, it’s hinted that the Markswomen’s psychic abilities come from genetic tampering sometime in the past. While I’ve seen the general idea of “sci-fi world loses all advanced tech, now looks like fantasy world,” I thought Markswoman had a fairly good version of it. I was glad that Kyra had friends among her order, as I always like to see positive depictions of female friendship. It’s only unfortunate that she spent so much of the book away from them. I also thought I saw a pattern of the villains being beautiful women, which could play into a negative view of femininity. I don’t think Markswoman was bad exactly. It passed the time, and I never considered quitting. However, I’m not planning on reading the sequel. Not entirely… but yeah it has some of those vibes. Granted I haven’t seen too many reviews of this, but yours might be the first that wasn’t positively glowing. It’s nice for me to get a more balanced view before heading into a book though, especially since I was and still am pretty psyched for this one. I’ll keep the pacing in mind; hopefully I’ll get to it soon! Maybe I’m just absurdly picky when it comes to YA fantasy? I feel like I’m getting really tired of some of the tropes. I’m always very skeptical about books that features assassin heroes/heroines. 105% of all times they never actually do their job. Makes me feel like they just call them assassin because that’s a “cool” thing. Anyway, I think my personal recommendation when it comes to this “area” of YAish fighter-school-sort-of-thing in recent days would either be Red Sister by Mark Lawrence or maaaybe Nevernight by Jay Kristoff. I’ve got Red Sister on my TBR! I’m planning to read it sometime this year.